Snorkeling excursion by boat on Gulf of Cagliari. Live the emotion and adventure among the marvels of the Gulf of Cagliari accompanied by a marine biologist! 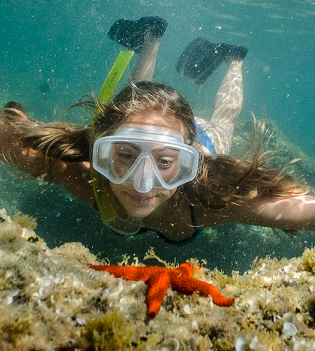 Snorkelling is not only a means of relaxation, but an experience that will always remain in your heart. Fish, coloured sponges, starfish and with a bit of luck dolphins as well will be our companions. You don't need to have any specialized swimming ability, all you need is the desire to be amazed! We have thought of everything: the boat, the equipment, an initial briefing and, to conclude in style, an aperitif based on tastes and scents of Sardinia. The only thing you need to bring is your suitcase! The excursion takes places under conditions of the utmost safety and abiding by the current legislation laid down for the Safeguard of the Environment and Tourist Profession. Our staff is highly specialized with qualifications in marine biology, underwater diving accompaniment, snorkelling instruction and excursionist tour guiding. The excursion is only undertaken if the weather conditions are favourable.